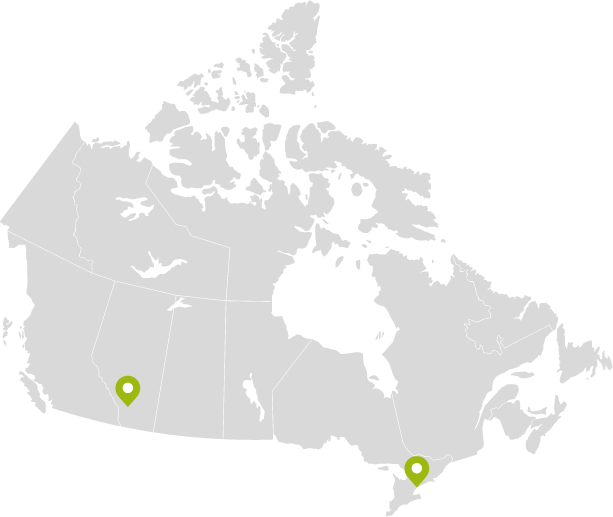 Early in 2016, the LoyaltyOne Corporate Responsibility team was tasked with relaunching the community investment strategy. Two priorities were clear. Finding opportunities to impact a community issue and engaging LoyaltyOne associates in the process. 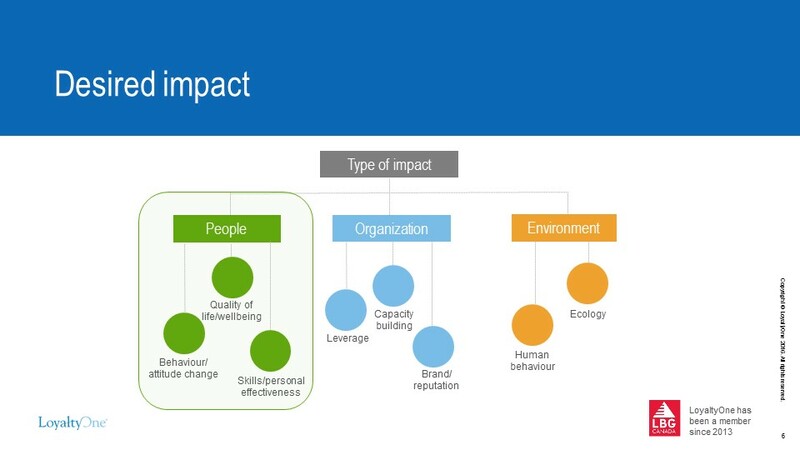 As part of their LBG Canada involvement, the team enrolled in a webinar on impact measurement. In that first session, exposure to the LBG Impact Measurement framework launched a strategy path that enabled leadership engagement, increased associate involvement and created opportunities to deepen relationships with new and existing community partners. Gaby Polanco-Sorto, Associate Director, Corporate Responsibility, shares the LoyaltyOne journey and how the LBG impact measurement framework contributed to the new strategy. When did you decide that you were going to relaunch your community investment strategy and embark on this process? Gaby: It happened about a year and a half ago when our CEO shared with us his vision for our community investment strategy. He asked us to identify a theme for our community investment program, a theme where we could have a real, tangible impact. to the goal was to identify a theme where we could leverage our associates’ interest and passions, while making a real impact in the community. He wanted to ensure our program had a tangible strategic purpose. How did you get to the place where you had an idea that you wanted to present to your senior leaders for them to consider? Gaby: We did interviews and hosted working sessions with our associates to really narrow down what they were passionate about, where they were spending most of their time volunteering, what causes they were giving to; and from that research we were able to identify that programs to impact marginalized children and youth were of real interest to our associates. This is how we came up with the Youth Empowerment Program. 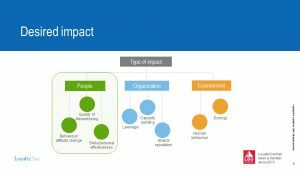 How did the LBG impact measurement framework help to shape your thinking? Gaby: We had an ‘ah ha’ moment when presented with the concept that all investment in community is about people, organizational or environmental impact. Identifying where we wanted to have an impact would help us narrow our focus enough to help us make strategic decisions, while not becoming too narrow that it stifled innovation and creativity. We knew we wanted to engage our associates in programs that impacted people. We knew we would meet CEO expectations if we focused on impact that improved and transformed lives. Did the experience lead you to engage with community partners differently? Gaby: Absolutely. We knew that we wanted to have measureable impact, but we let our community partners come to us with ideas on how to impact marginalised children and youth within our primary areas of interest. We shared with them the LBG impact measurement framework concept, which stimulated conversation about how their programing could achieve our impact goals. The framework allowed for flexibility and actually gave the charities more power to let us know what kind of impact they could help us achieve. After all, they are the experts working in the frontlines. Gaby and her team used the LBG impact measurement framework to the fullest. It framed communications between the team and executives, with community partners, and in training of the CEO appointed Youth Empowerment Council as well as LoyaltyOne associates who volunteered to participate on the Associate Donations Committee. Gaby: When we set up our Youth Empowerment Council to review proposals over $25,000, we included this framework as part of their training and said this is how we want you to think about impact. This framework helped to shape the type and depth of impact we hope to achieve. The feedback from that training was extremely positive. Gaby: It became so clear to everyone, the impact that we wanted to have, without having to create numbers or dashboards. It gave the Council a better sense of how we hope to work with our community partners. It gave us the tools to think strategically, on an on-going basis about the decisions we were making. It also helped to create a genuine partnership with charities, and redefined the relationship we had with charities we had already been supporting for years. Most importantly, charities told us they appreciated not having to spend their valuable resources on trying to meet unrealistic reporting requirements that would not reflect the impact they were truly making in the communities. We presented the framework in the exact same way to our Executive Team as we did the Youth Empowerment Council and our community partners. Every group appreciated that transparency, and understood that we really want to work as a collective unit to achieve our goals. Do you think you’ll use the Model on an on-going basis as you roll out your strategy? Gaby: I absolutely think that it will be on-going. At the end of this year, we will be asking our community partners for a progress report of qualitative and quantitative data using this framework – but the actual metrics will be theirs. 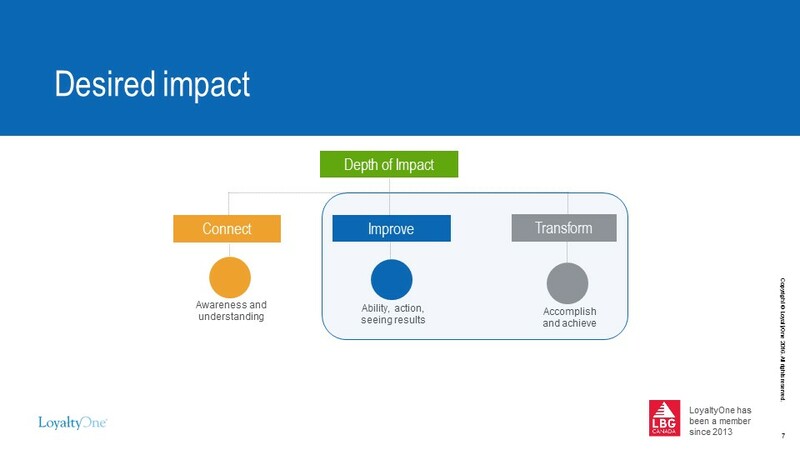 We will then be able to go back and say this is the framework we used to identify impact, and this is the actual impact we’ve had this first year. We’ve used the LBG Model as a key concept of our strategy. Two-to-three years from now we want to be able to engage with our clients, charities, government and other corporate organizations that are focusing their efforts on children and youth with the intention of using this framework to help find opportunities for us to collaborate. Our senior leaders really value the strengthening of existing partnerships that the Youth Empowerment Program provides, but also recognize the exciting possibility of presenting this across the larger LoyaltyOne community of stakeholders. One last thought to share with other interested in impact measurement? Gaby: Simple is better!!!! 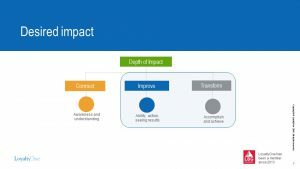 Too much effort is often put on measuring impact than actually creating impact – so focus less on numbers and more on a framework that will guide your decision making process.